Forex arbitrage is an opportunity to get a quote for a fraction of a second before it appears in the broker’s terminal. This is a real time machine! Arbitrage trading (price latency arbitrage) - a strategy in which the trader gains an advantage due to earlier access to market information, for example, using a direct (cross) connection to the trading platform, hosting servers near exchanges. Why there is a delay in quotations on the stock exchange? Exchange Nanex conducted research on the behavior of HFT traders after the Flash Crash, which occurred in 2010. Market manipulations by high-frequency traders were found, which included the rapid entry and removal of a large number of orders and attempts to create market confusion and trading opportunities for HFT traders themselves. 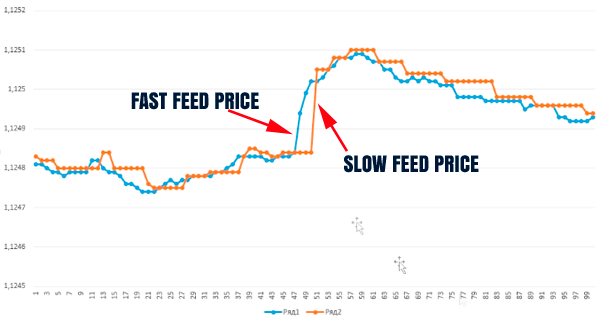 Trading robots delay price quotes while filling in the order book, simply placing and canceling orders at a speed substantially exceeding the capacity of the market data transmission channel on the exchange. Orders are accumulated in buffers, and the delay (increased delay) lasts until the buffer is exhausted. Such phantom orders with a speed of more than 10,000 messages per second , even for a fraction of a second, delay exchange channels. View a list of Software for Latency Arbitrage. Why there is a delay in quotations on forex brokers? Everything is much simpler here. Most Forex brokers are “kitchens” or clearing organizations in which client requests for conducting trades are satisfied by counter requests from other clients of the same broker or by the broker. If the broker does not have a counter-order and does not conduct an external operation, the broker independently acts as the opposite party to the transaction and a conflict of interests arises - the client’s profit turns into a loss for the broker, and the client’s loss - the broker’s profit. The broker uses quotes from his liquidity providers, and in most cases executes the transaction at the worst prices for the client. Meta Trader4 / Meta Trader 5 / cTrader trading terminals receive brigge, special software. The rate of processing applications is very low and in most cases the broker does not use a high-speed data transmission channel (since this is an expensive technology). Thus, due to the lack of software on the server side of the broker and other internal reasons, quotes on forex brokers are lagging behind the real stock quotes and there is a possibility for latency arbitrage. Price delays can reach 2-5 seconds. On average, it is 500 milliseconds. This is quite enough to place an order at the old price and make a profit in a few seconds! Since 2007, Westernpips Group has been developing software for latency arbitrage in Forex, CFD`s, Crypto currency markets. To date, we present a wide range of tools for automated trading using strategies based on lagging quotes. The Trade Monitor 3.7 Software is a universal data feeder connected via FIX / API technology to the largest and fastest providers of quotes. Using the program gives you a guaranteed speed advantage over all existing brokers. You just have to choose a broker and start earning now! Keep up-to-date on the most relevant advances in latency arbitrage technology with the following research video. Software Westernpips Crypto Trader 1.7 was created with the purpose of consolidating quotes from all the largest cryptocurrency exchanges, analyzing the received quotes and automatic conclusion of transactions on these exchanges. Type of high-frequency trading. A trading strategy is the basic rule of which is to search for the fastest economic data and use this data as forecast values in slower markets. One of the variants of such a trading strategy is price arbitrage or trading on a backlog of quotes. Strategy for trading in the Forex market. Search for a fast flow of quotes for currencies and CFD`s indexes on advanced technology exchanges, such as Lmax Exchange, Rithmic and others. Trading using automated trading robots (EA) that use a fast-paced quote stream as a leading signal to enter a trade. Fully automatic trading robot in arbitrage strategy in Meta Trader 4 / Meta Trader 5 / cTrader trading terminals. For quick/fast quotes, can use FIX / APIs connection or other brokers with ultra-fast quotes. Compares quotes and enters a hang / lag / delay signal of quotes. EA Newest Pro 3.7 Exclusive is the best choice for those who begin to get acquainted with forex arbitrage. Special software (robot) for trading in forex arbitrage strategy. It concludes short transactions lasting less than 1 second and receives a guaranteed profit due to the prediction of the rate, based on faster quotes from the exchange (liquidity provider). Forex broker (dealing center) to work on forex arbitrage strategy. Such a broker should allow trading with a transaction duration of less than 1 second and it is advisable to have Instant Execution (order execution at the asking price without slippage). Ping with a broker should be a minimum of 0-10 ms. Also, such a broker must have regulation in order for your deposit to be protected and you can withdraw your profit. Еrading on the Forex market (FX) using latency arbitrage algorithms. For successful trading, it is better to use reliable software and a dedicated server located in the same data center as the supplier of fast quotes. Еrading algorithm for the Forex market (FX) based on the price difference (lagging quotes in different markets, exchanges, brokers. In addition to trading in currencies, it can also be used on gold, silver, oil, and also on CFD`s indexes. Arbitrage is without a risky and fully automated trading system that allows you to earn from 50-500% per month. You only need to find a broker that is suitable for arbitrage. Еhe use in their trade of high-frequency robots / expert advisers making short (second) deals, most of which are profitable. In order for the broker not to recognize the use of arbitrage trading on your account, it is worthwhile to increase the duration of the transactions and apply the hidden arbitrage algorithm. Trading robot / expert advisor which the trader uses in his account for quick profit. T his type of advisors can increase the score by 500% or more in 1 day. The incredible profitability is due to the fact that the robot uses the strategy of arbitrage on Forex and knows in advance what the exchange rate will be in a few seconds. Trading in the financial market using expert advisors / robots / EA using an arbitrage algorithm. Arbitrage in the Forex market has become possible thanks to new technologies for processing large amounts of data in a short period of time. The bandwidth of the channel for obtaining quotes plays the main role and determines whether the broker will give fast quotes or, on the contrary, slow quotes where there is a possibility of earnings for arbitrage traders. Special software for automated trading by arbitrage strategy. A program connected to fast quotation providers and transferring these quotes to a trading advisor to compare deals and trading. A large selection of tools and data feed providers offered in the program Trade Monitor 3.7. There are also software for arbitrage trading directly through the FIX protocol and trading in the cryptocurrency market. The use of automatic arbitrage software gives an advantage in speed and the ability to analyze quotes at intervals of less than 1 millisecond. The human eye only perceives data changes in the range of 20 milliseconds. Minimizing the time spent on searching and transmitting the trading signal from the client to the broker’s trading server. Today, ultra-low latency is a time stamp of less than 1 millisecond. High-frequency traders focus on speed at the level of nanoseconds. Only professional software can perform all the algorithms with low latency, so if you are interested in this type of trading, then trust your capital only to trusted companies. For trading according to the strategy of arbitrage, we cannot do without robotic trading systems and algorithmic methods with low latency. Software developed specifically for high-frequency trading will be an excellent tool and assistant for you. Having understood the settings, you can easily manage a complex trading system and end up with the expected profit. Software from the company Westernpips Group is the most reliable tool proven by thousands of traders around the world. The most powerful tool in the hands of a professional trader. Brokers are not able to provide a fast enough channel of communication with their supplier of quotations, due to its high cost, due to which quotes may lag behind. Using special programs for getting quick quotes and advisors for trading on a slow broker, a trader can earn almost no risk, since he will receive signals with 100% probability. Further, the profitability of arbitrage transactions will depend on the speed of order execution by the broker and ping with the trading server. Choosing a broker for trading with arbitrage is not an easy task. The main factor that is worth paying attention to is the regulation of the broker, the minimum deposit, the availability of the necessary trading instruments. Best brokers with Instant Execution of transactions or STP brokers. Also ECN brokers that do not use plugins and work honestly will do. It’s still half way to choose a broker by the necessary criteria, then you need to test him for quotes delays and lack of slippage. The broker must approve scalping and short trades. If the broker’s regulations have restrictions on the minimum duration of transactions, then a hidden arbitrage strategy should be applied on it. Since 2007, the best adviser for arbitrage has been Newest PRO 3.7 Exclusive. This is a fully automatic trading robot with a variety of algorithms and settings for all types of arbitrage. Constant updates and improvements have made this advisor the best. No analogues in the network. Westernpips takes into account the wishes of customers and makes the most profitable trading systems for the Forex market, CFD`s and crypto currencies. A variety of advisor versions: Classic, CFD`s, Hedge, Hidden, News provide an opportunity to bypass all brokers' bans and get a decent profit! Finding opportunities for arbitration is a difficult task. But if you have a special software that analyzes quotes from different brokers, then it will save you time and help you quickly find a broker suitable for arbitration and trading tools. In the arsenal of the company Westernpips there is such a development - this is the program Westernpips Analyzer 1.3. It allows you to carry out a detailed visual analysis of quotes and ticks, as well as trade on the strategy of 2 leg arbitration (hedge between different brokers). In addition to the latency of arbitrage, there are other trading strategies. These are currency arbitrage, static arbitrage, spread arbitrage, pair trading, HFT trading. All these strategies deserve special attention, and the trader must understand all the risks. Latency arbitrage is one of the most risk-free trade, unlike the others. For example, for Currency Arbitration, you need to have accounts on different brokers and this creates additional risks of losing a deposit on one of the brokers, as well as the need for a periodic flow of money from one account to another. The cryptocurrency market is developing rapidly and the presence of a large number of exchanges creates opportunities for arbitrage trading between them. The program Westernpips Crypto Trader 1.7 is a novelty on the arbitrage market and gives the possibility of cross-exchange arbitration Bitcoin. The difference in quotes on different exchanges reaches 20-30%. The periods of high volatility of the bitcoin rate create a mass of arbitrage situations. If you like the cryptocurrency market, then you need a program for bitcoin arbitration. The simplest example of arbitrage can be called a situation where, for example, the price of EURUSD on Forex broker is 10 points different from the price of futures 6E on the CME exchange. The difference between the futures price and the price of a similar contract in the Spot market is the basic example of arbitrage. But for an ordinary trader, it looks difficult and it is not entirely clear how to make money from it. 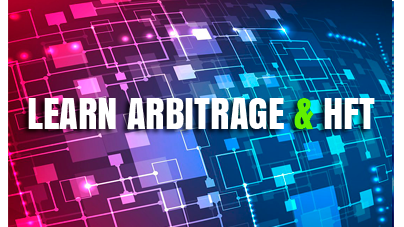 Therefore, there is a simpler method of arbitration, based only on the advantage in connecting to the server quotes and making a profit of several points due to price gaps and the difference in quotes on a fast and slow broker. This is a price / latency arbitrage. All you need is a fast flow of quotes, a good dedicated server and a trading advisor conducting a fully automatic analysis and comparison of quotes with a speed in fractions of milliseconds. Trading on price difference and making a profit on a broker, where there is a lag in quotations. The difference in prices for different quotes providers and brokers is created due to bugs on the broker’s trading server side, broker’s desire to smooth out quotes jumps, averaging prices, correlations, spread differences, poor communication channels and much more. You can earn money on it and for this Westernpip has all the necessary tools. A more professional type of arbitration used in the stock market. This is a search for opportunities for static arbitration between stock quotes of companies of a similar sector of the economy, and between stock quotes of companies included in the calculation of basic indices of countries such as DAX, S & P 500, Dow Jones, NASDAQ, FTSE 100 and others. To do this, you need to have an account for trading in the futures market in a brokerage firm that provides access to trading on the stock exchanges of the world. View the monitoring, reporting and trading advisors examples in real-time. After seeing them you can plunge into the world of high-frequency trading and to feel the spirit of this profitable trade. All reports and monitorings only with live accounts, real investors. Good luck watching!